Reading and share top 15 famous quotes and sayings about Honoria by famous authors and people. Browse top 15 famous quotes and sayings about Honoria by most favorite authors. 1. "The wind smelled of humus, lichen, the musky odor of pecan husks broken under the shoe, a sunshower on the fields across the bayou. But any poetry that might have been contained in that moment was lost when I stared into Honoria's face, convinced that human insanity was as close to our fingertips as the act of rubbing fog off a window pane." 2. "That's all he said?' Mrs. Royle demanded. 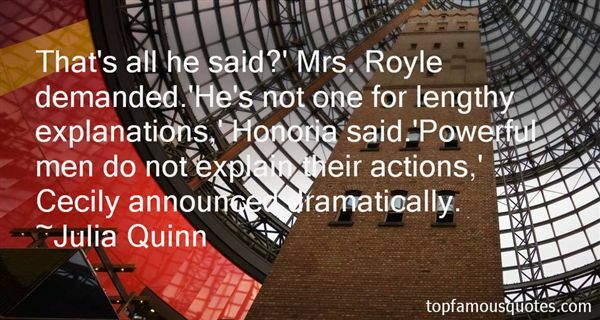 'He's not one for lengthy explanations,' Honoria said. 'Powerful men do not explain their actions,' Cecily announced dramatically." 3. "Oh, Daniel," his mother exclaimed, catching him before he could make his escape, "do come join us. We're trying to decide if Honoria should be married in lavender-blue or blue-lavender. "He opened his mouth to ask the difference, then decided against it. "Blue-lavender," he said firmly, not having a clue as to what he was talking about. "Do you think so?" his mother responded, frowning. "I really think lavender-blue would be better. "The obvious question would have been why she'd asked his opinion in the first place, but once again, he decided that the wise man did not make such queries." 4. "If you do not apologize to Lady Honoria," Marcus said, his voice so mild as to be terrifying, "I will kill you. "There was a collective gasp, and Daisy faked a swoon, sliding elegantly into Iris, who promptly stepped aside and let her hit the floor. "Oh, come now," Mr. Grimston said. "Surely it won't come to pistols at dawn. ""I'm not talking about a duel," Marcus said. "I mean I will kill you right here." 5. "Honoria had a plan.It had come to her in church that morning. (The ladies went; the gentlemen somehow managed to get out of it.) It wasn't terribly complicated; she needed only a sunny day, a halfway acceptable sense of direction, and a shovel." 6. "They all turned to the dark-haired woman standing quietly to the side and slightly behind Aunt Charlotte. She was, in a word, gorgeous. Everything about her was perfection, from her shiny hair to her milky-white skin. Her face was heart-shaped, her lips full and pink, and her eyelashes were so long that Honoria thought they musttouch her brows if she opened her eyes too wide. "Well," Honoria murmured to Iris, "at least no one will be looking at us." 7. "Daisy said boldly. "Nothingventured, nothing gained. ""Yes, but it is a wise man who understands his limits. ""Who said that?" Daisy asked. 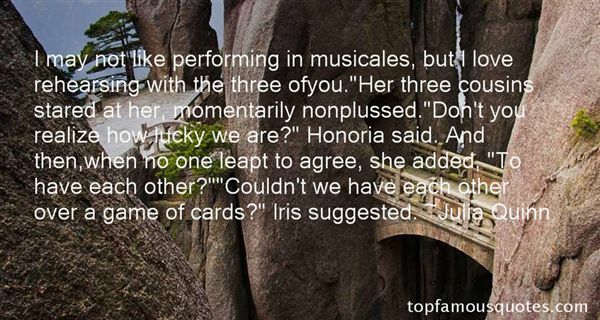 "I did," Honoria answered impatiently"
8. "It was going to be embarrassing regardless of what music theychose, but Honoria didn't have the heart to say it to her face.On the other hand, whichever piece they performed, they wouldsurely butcher it past recognition. Could a difficult piece playedbadly be that much worse than a slightly less difficult piece playedbadly?" 9. "Thank you," she whispered, sending up a quick prayer for his continued recovery. "You're welcome," Marcus murmured.Honoria let out a little shriek of surprise, jumping back nearly a foot. "Sorry," he said, but he was laughing.It was quite the loveliest sound Honoria had ever heard. "I wasn't thanking you," she said pertly. "I know." He smiled"
10. "Watch over Honoria, will you? See that she doesn't marry an idiot." 11. "I may not like performing in musicales, but I love rehearsing with the three ofyou. "Her three cousins stared at her, momentarily nonplussed. "Don't you realize how lucky we are?" Honoria said. And then,when no one leapt to agree, she added, "To have each other? ""Couldn't we have each other over a game of cards?" Iris suggested." 12. "The scheme had been, if I remember, that after lunch I should go off and caddy for Honoria on a shopping tour down Regent Street; but when she got up and started collecting me and the rest of her things, Aunt Agatha stopped her." 13. 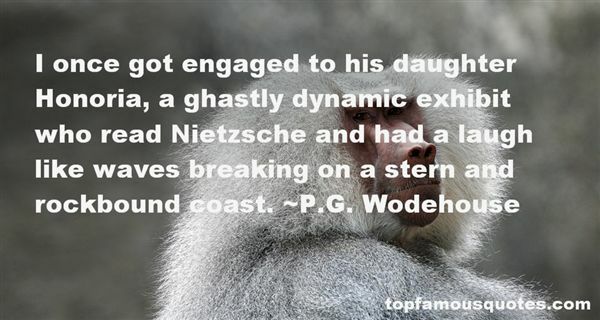 "I once got engaged to his daughter Honoria, a ghastly dynamic exhibit who read Nietzsche and had a laugh like waves breaking on a stern and rockbound coast." 14. "Honoria, you see, is one of those robust, dynamic girls with the muscles of a welter-weight and a laugh like a squadron of cavalry charging over a tin bridge. A beastly thing to have to face over the breakfast table. Brainy, moreover. The sort of girl who reduces you to pulp with sixteen sets of tennis and a few rounds of golf and then comes down to dinner as fresh as a daisy, expecting you to take an intelligent interest in Freud." 15. "Laura decided to send a cable to Lady Honoria after all, on the chance that she might still reach her in Baden-Baden. But while she was planning what to say, she felt, all of a sudden, the room start to spin about her, dizzying her, so that she fell back across the bed and across the pillows wondering what was happening to her until everything went as pitch-black as night and she sank down and down and down into a dark, endless tunnel." Doing a scene truthfully is very similar to doing a song truthfully. They're really parallel."